As the boys grew, Roland and Faye found time for their own interests such as curling and golfing. They started travelling, seeing places they had wanted to see and creat­ ing new memories to share. It was rare to see them apart-not only were they husband and wife, they were best friends. Roland took a tremendous interest in his sons' activ­ ities. Rarely was a hockey or baseball game unattended. If Roland was not coaching his sons, he was there as a spec­ tator. During this time, he was instrumental in the development of Brandon Youth Hockey, as we know it today. As the boys grew up, Roland was able to find time to golfin the Bushwhackers Men's League at Glen Lea Golf Course in Brandon. In his professional life, Roland had several ventures ranging from a trucking company to a delivery business. Faron and Trevor worked for R. Lee Delivery from the time they both could drive. Roland's friendly and outgoing personality, in conjunction with his sheer size, made him not only a recog­ nizable person within the community but also a very popular one. Roland was affectionately known to his friends as 'Tiny'. Sadly, Roland passed away in December 1993 at the age of 47. Faye (nee Johnson) - family was her life. Any social outing revolved around her boys. She was a stay-at-home mom until Trevor turned eight. At this time, she took a posi­ tion at Woolco. She was a Customer Service Supervisor there and, when Wal-Mart took over, she was then given the title of head Customer Service Manager. Faye enjoys golfing, walking, bowling and the never dull company of her sisters. She still resides in the house that she and Roland shared in Brandon, although she returus to her roots to enjoy the summer weather at her cabin in Clear Lake. Faron finished school in 1986 and headed out west to New Westminister, BC, to attend Douglas College. There he majored in marketing and commerce. 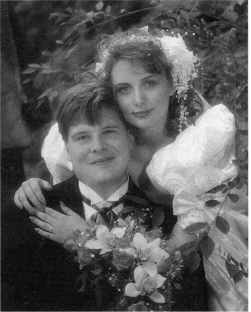 Faron met his wife, Tamara, in 1989. 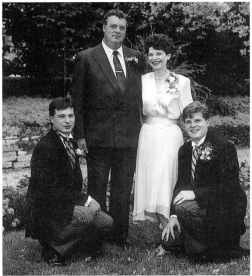 They were married in Winnipeg on August 17, 1991. Faron was the Sales Manager of Auto Trader Magazines, Manitoba/Saskatchewan Division until the birth of their first child, Landon Faron Edward, March 23, 1992. After that, the family moved back to Brandon and became involved with R. Lee Delivery-A second son, Drake Roland Wayne, was boru on January 4, 1994. After the untimely death of Roland, the family company was dissolved and Faron sought new endeavors. He tried his hand at many opportunities but found very little satisfac­ tion. A third child, a daughter, Tessa Tamara, was boru on August 28, 1997. Faron and Tamara purchased a half section of land north of Sandy Lake, where they raise Black Angus cattle. They both work at Elkhoru Resort and the children attend Sandy Lake School.